Detailing trauma. Things that can go wrong. So many sites on the body map. With a flowing narrative that examines the suffering and healing of the human body and soul, Detailing Trauma weaves a thoughtful and heartfelt discovering of the connection of the physical and psychical self. Arianne Zwartjes writes seeking meaning from this intangible life using the trauma experienced by the very tactile and tangible human body. As she weaves, she asks the reader to consider both the trauma and the healing experiences of life. She ultimately sees that this life is given in order to learn to remain tender and to cultivate joy. Detailing Trauma, in a way, is an adventure novel with a protagonist of thought traveling through the jungle and awe of the human body. The world of trauma and disease are mapped and analyzed for psychical meaning. Not only are we led through the journey of psychical awareness, though, we are also delightfully introduced to the beauty and complexity of the human biology. Zwartjes takes the reader from skin to cell, bone to brain and escorts us into the details of the workings of the body. It is an amazing and awesome journey that she artfully and accurately unfolds. 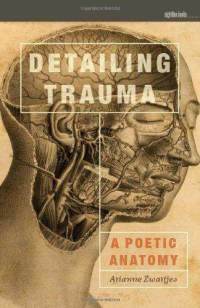 Even more than mapping, though, as the subtitle outlines, Detailing Trauma is about poetry. The words Zwartjes uses are pure and have the effect of a scalpel, cutting into the illusions of our physical selves and our relationships. We find ourselves scrubbed into awareness. In her own words “perhaps this scouring can shed what isn’t needed, sloughing off the dead skin built up over years of living, in fear of breaking, our faces turned away.” Zwartjes quotes Pierre Tielhard de Chardin: throughout my whole life, during every minute of it, the world has been gradually lighting up and blazing before my eyes until it has come to surround me, entirely lit from within. This is the power of Zwartjes’ writing, that as we read Detailing Trauma, we are steeped in its burning layers and gradually come to understand our own lives in a whole new light.